I started at a new school last year in a new classroom, so there were lots of things that I wanted to do that just didn't get done! One of those things was labeling the baskets where we keep supplies in the writing center. 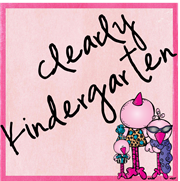 I was totally inspired by the amazing things that I saw while I was blog hopping!! I loved quite a few sets that I saw especially the ones at Ladybug's Teacher Files. 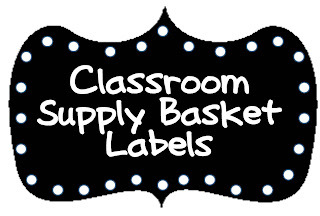 My only problem is that kindergarteners are very literal and if the label has scissors, markers, and crayons on it they will put all of those things in the same basket regardless of what they label says. (Maybe that is because at the beginning of the year many of them can't read, but that is beside the point!) So I used the labels that I saw as inspiration and created my own. Since I don't have a TpT or Teacher's Notebook store yet you can click on the picture below to see them and download them for free. I hope you enjoy them! If you do please consider becoming one of my first followers! I love the contrast of black, white dots, and the colors of the supplies. The labels go with my room of black backgrounds and white polka dots on lime green/aqua blue borders. Thanks for sharing. Great I'm glad you can use them! Thanks for the comment!